City Council votes 8-2 in favour of challenging the B.C. government's decision to grant environmental approval to the controversial pipeline expansion project. Vancouver city councillors passed a motion Wednesday to request a judicial review of the B.C. Liberal's environmental approval of the controversial Kinder Morgan expansion project. The motion, introduced by Green Party Councilor Adriane Carr, was passed by an eight-two vote inside Vancouver City Hall after several community speakers highlighted a lack of public consultation from the province. Speakers also maintained that no comprehensive studies have been done to model the damaging effects of a bitumen spill along the B.C. coast. Carr hopes the court will also recognize these shortcomings and revoke the project's environmental approval. "At the very minimum, [the judicial review] will slow down the whole process in terms of moving forward with the Kinder Morgan project," she told CBC News. "In the best case scenario it would lead to the province changing its position, and having to say 'no' to Kinder Morgan — and that would be a real win." Lawyers from the City of Vancouver will now petition the Supreme Court of B.C. to move forward with the review. If the court decides to do so, it will assess whether the provincial government acted appropriately in granting Kinder Morgan environmental approval. "It's my firm belief that [further research] would point to the decision to say 'no' to Kinder Morgan," she said. The provincial government approved the twinned pipeline project last month after Premier Christy Clark said all five conditions for support had been met, which includes a 'world-class' spill response strategy and consultation with First Nations. But Carr says the province didn't do its due diligence, and instead deferred to the federal government's environmental approval, which includes 49 conditions imposed by the National Energy Board, rather than develop its own environmental assessment. And this isn't the first time the province has run into trouble by deferring an assessment to the feds. In January 2016, the B.C. Supreme Court ruled that the province had to conduct its own environmental assessment for the Northern Gateway Pipeline after the project was approved by the federal government. The court ruled the provincial government failed to properly consult with First Nations. After further setbacks, the pipeline was officially rejected by the Trudeau government. But the provincial government says they have held up their end of their end of the bargain for a project that will protect the province's environmental and economic interests. 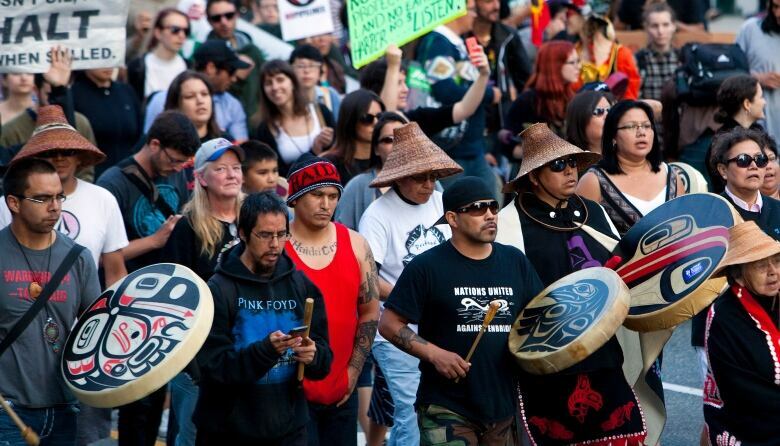 "We conducted consultation with First Nations as ordered by the B.C. Supreme Court, and added an additional 37 legally-binding conditions that are in addition to, and designed to supplement, the 157 conditions required by the National Energy Board," said the Ministry of Environment in a written statement to CBC News. The ministry says the province is expected to receive over $1 billion in investments from Kinder Morgan over the next 20 years, as well as a $1.5 billion investment from the federal government for a world-class marine spill response.